What could a top Google ranking do for your business? Want to build a million dollar junk removal business but don't know where to start? You're in the right place. While paid ads can be extremely effective at attracting and converting site visitors, a large percentage of online shoppers skip paid results altogether. To add turn these potential site visitors into paying customers, you'll need to rank well in the organic results. This is accomplished through Search Engine Optimization (SEO). SEO is a lengthy and complicated process involving on-page and off-page optimization and strategic linking, consistent content creation, and strategic website architecture. However, SEO is well worth the investment, and you don't pay for clicks on organic results. Pay-per-click advertising is a great way to instantly generate more business for your junk removal company. However, an improperly structured campaign can quickly turn into a money pit without any results. Junk Removal Authority's unique ad campaign is designed to avoid wasted Ad Spend and ensure that you're bringing in tons of profitable junk removal jobs. 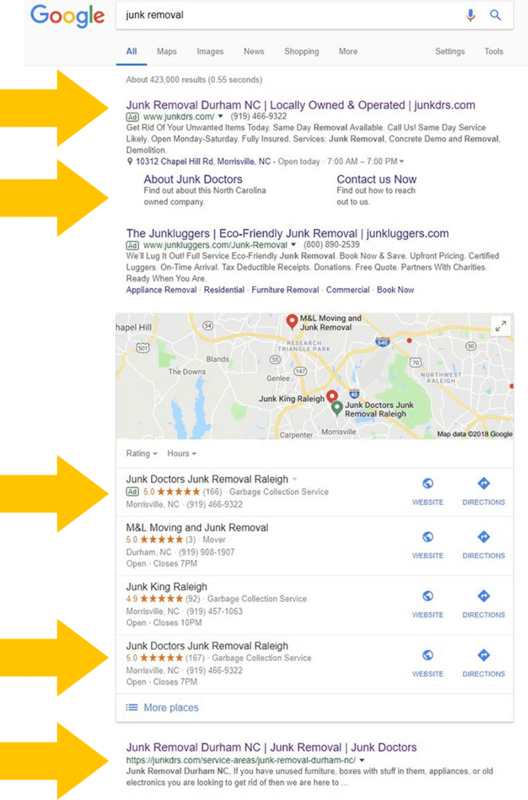 Using the formula we developed and perfected for our own junk removal company’s pay-per-click campaign, we can help you sit atop the Search Engine Results Page in your area, so you're the first thing a customer sees when they need junk removal. Have you gotten calls from lots of so-called SEO and pay-per-click advertising management companies trying to sell you their services? Have you used one of these services without seeing results? Do you want to be highly competitive online without throwing away your money? You’ve come to the right place. Unlike other SEO and ads management companies, Junk Removal Authority works specifically in the junk removal industry. This means our campaigns are tailored precisely to the keywords and strategies that work best for junk removal businesses across the country. That’s great news for your junk removal business – it means we know exactly how to get your site ranked highly on Google and other search engines, which means more calls, bookings, and customers for you! Ready to attract tons of new customers?